"Issy Bissy" Missy is 16 weeks old. 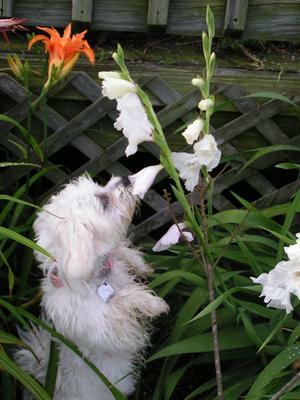 Recently, our back yard garden has started to bloom, and Missy just loves to pluck the flowers she can reach, and play with them. We just can't scold her for it; she's too adorable! What adorable dog! What adorable picture! What a gorgeous snap shot picture u were able to capture. Oh yeah she is way too adorable. What a cute pic! I concur - you can't punish your baby for plucking the flowers and playing with them. Cotons are very curious. Our Molly eats the crocus when they start to bloom. What can you do? Missy is adorable. Cute photo.